One of the important parts on many bridles, especially English bridles, is the noseband. The noseband is the part of the bridle that goes around the horse’s nose. Plain nosebands on English bridles are called cavessons. The cavesson is not attached to the main part of the bridle on an English bridle, but rather hangs on its own narrow cheek pieces that sit beneath the cheek pieces of the headstall of the bridle. On western and other types of bridles, the noseband may be attached directly to the cheek pieces of the bridle. The purpose of the noseband or cavesson is simply to help keep the bridle on the horse. Most horses don’t need anything other than a plain cavesson or noseband. However, slight alterations to the simple noseband can increase its usefulness for controlling the horse. These are the most commonly seen nosebands. A drop noseband hangs lower on the horse’s face, hanging down below the level of the bit rings, and helps prevent the horse from opening its mouth and evading the bit. A flash noseband is a small strap attached to the top of the cavesson that buckles underneath the horse’s chin, below the bit rings to keep the horse’s mouth shut so it can’t evade the bit. A figure eight or grackle noseband. Ronjamin -Ronald C. Yochum Jr. The cheek rings of a figure eight noseband sit high up on the horse’s cheeks, and the straps cross over the horse’s nose and buckle under the horse’s chin like a flash noseband. It helps keep the horse’s mouth shut, but may be more comfortable for the horse, as it does not impair the expansion of the horse’s nostrils. Horses that must jump or gallop hard may be better off in a figure eight than a flash noseband. This type of noseband is often seen on race horses. This may also be called a grackle noseband. There are other nosebands involving levering buckles that can be tightened and nosebands that transfer some of the pressure of the rein aids to the nose. These types of nosebands should be used only by experts as they can mask, rather than solve some problems. The noseband shown in the photo is a Kineton noseband, which puts pressure on the horse's nose when the reins are pulled. 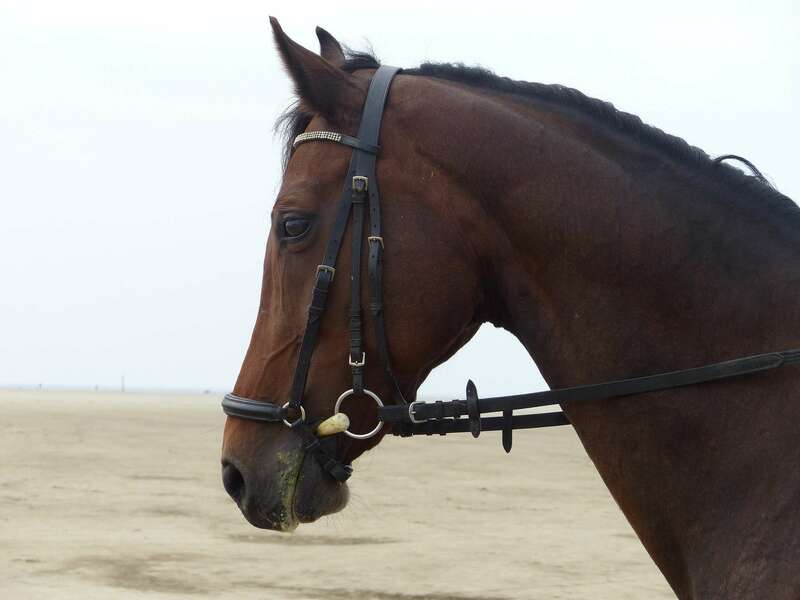 Nosebands can also be used to attach martingales and tie-downs. A standing martingale is a strap that attaches to the girth, runs up under the horse’s chest and attaches to the underside of the noseband. This prevents the horse from tossing its head up and down and evading the bit. A western tie-down attaches in a similar fashion, but the noseband itself may be of flat leather or a material like rope that inflicts a sharper pressure on the horse’s nose. The photo shows a noseband with a tie-down attachment. The loose end would go between the horses' front legs and attach to the girth or cinch. On bitless bridles, the horse is controlled by pressure on the noseband. The noseband may be flat, rolled, or may be thick rope that is left bare or leather covered as often seen on side pulls. On hackamores, the noseband may be quite wide and lined with fleece. In the show ring, nosebands are a part of good turn-out. Some nosebands may be decorated with fancy stitching or other adornments. Sometimes the rider’s hands are to blame. If you are too heavy-handed, your horse may try to relieve the pressure by opening its mouth. Without correcting the problem, and strapping your horse’s mouth shut, you may create even more problems that are more difficult to fix. The International Society for Equitation Science recommends that any type of noseband be tightened so that two fingers can be inserted between the noseband and the top of the horse’s nose. A noseband that is too tight can cause a horse pain and restrict jaw and tongue movement. Nosebands can be useful tools when used properly. It’s worth taking the time to ensure you are being fair to your horse by using one the right way.